I am often very busy but I am a firm believer in serving home-cooked meals. My compromise is to cook simple meals that take little time, yet are packed with favors. And to do that, I frequently make use of a few types of cooking techniques. One of these is to cook stews. Stews are easy to cook because all it really involves is the searing of the meat (you can even choose to omit this step) before all the ingredients are placed in a pot and cooked. At the end of this process, you have a great meal to serve with some carbs, be it bread, rice or pasta. To cook a good stew, you need a good pot, and today I am going to show you how easy it is to cook this One-pot Beef and Shallots Stew using a non-stick casserole pot from Corningware’s Retroflam range. The pots and pans in the Retroflam series are very well-made indeed. They conduct heat evenly, which means that you do not have to keep stirring the food as it cooks. In addition, since the pots and pans are non-stick, you don’t have to worry about the food sticking either. The Retroflam range of cookware are also non-toxic and are made of black titanium and sparkling pearl ceramic coating. This ensures that the pots remain easy to clean. Unless I have used the pot heavily, I simply wipe of any residue with kitchen towels and wipe the pot with some oil. Totally fuss-free! I love beef stews. When cooked over a period of time, the connective tissue in the meat breaks down and the meat becomes soft and tender, and at the same time, the gravy becomes more flavorful. The stew recipe that I am sharing today is a simple one because only one other main ingredient is involved, and that is eschalots. 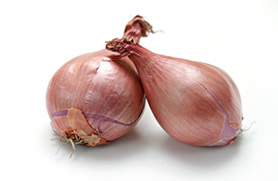 Eschalots are small, dry onions with a milder and sweeter flavor than the larger onions. I love using these shallots in stews because they mostly hold their shapes when cooked and are delicious! I chose to add red wine to the stew because the wine gives the stew a rich and robust body. I used Shiraz, which is a rather heavy red wine but you can use any wine that you like. Here are in the instructions on how to cook this stew. Season the beef chuck with salt, black pepper and corn starch. Mix to coat evenly. Sear the beef in some olive oil in the Retroflam Casserole in batches. The beef should be light brown. Transfer to a bowl and set aside. Pour away the oil in the casserole. Into the casserole, add the eschalots. Stir to lightly brown them. Transfer them to a bowl and set aside. Return the beef and juices into the casserole. Add the red wine and beef (or chicken) stock and turn up the heat. Bring this to a boil. Return the eschalots into the casserole and add the garlic cloves. Also add the thyme and bay leaves. Give everything a stir and simmer, covered for 45 minutes to an hour, or until the beef is tender. Give the stew a stir once in a while, and top up with water if required. Once the beef is tender, season the stew with salt and black pepper, and add the corn starch slurry to thicken the stew. I like to serve this with a crusty loaf of garlic bread, but rice will be great with this stew too! Sear the beef in some olive oil in the Retroflam Casserole in batches. The beef should be light brown. Transfer to a bowl and set aside. Discard the oil in the casserole. Add the thyme and bay leaves. Give everything a stir and simmer, covered for 45 minutes to an hour, or until the beef is tender. Give the stew a stir once in a while, and top up with water if required. Serve hot, with rice or bread. Hihi is there a specific part recommended for the beef? N the garlic with skin on?